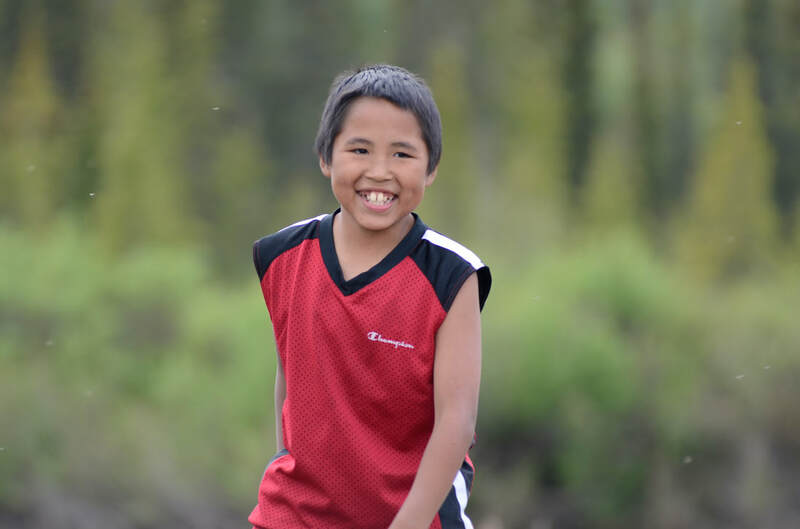 Our camp is simply known as, ‘Bible Camp.’ Bible Camp is located on the North River, roughly ten miles from Unalakleet. Bible Camp serves over four hundred campers each summer ages nine to twenty-five. Campers come from over thirty different villages all over rural Alaska, though most campers hail from the Norton Sound, Yukon Delta, NANA region, and Kobuk area. A lot of other things happen at camp too. We eat great food, go on adventures, have some free time and enjoy different activities. Campers hear and often respond to the Gospel and experience a loving and safe family of believers who serve as staff. Every year, we are excited to meet new campers - we look forward to meeting yours! Campers may register for the camp based on the grade they have just completed. Campers during June have worship twice daily, three square meals (plus a snack! ), and tons of fun activities. Everyone is welcome at these Camps. ​Visit the CAMPER REGISTRATION PAGE. When campers arrive in Unalakleet by air they are picked up by our staff at the airport. All campers then check-in at the Covenant Church Auditorium before leading for camp. The drive to Bible Camp is about ten miles, covering hills and valleys. The dates posted for each camp include dates of travel. The first date listed on the registration form, campers fly to Unalakleet, check-in, and travel up to Bible Camp in the afternoon. Check in for Unalakleet Campers is at 3 PM on the first day of camp. The final day on the registration form is also a travel day. Due to the nature of travel in rural Alaska, the large number of campers flying, and the remote location of the Camp, campers return to Unalakleet the evening before the travel day to ensure everyone is present for their flight. Campers from out of town, who do not have written permission from their parent or guardian to stay with relatives or family friends are supervised in the Covenant Church's Youth Facility by Bible Camp staff until their departing flights. This time typically includes meals, movies, snacks, and games. When flight cancellations occur, campers may return to camp for an additional night subject to the discretion of the camp staff. Unalakleet campers check-out and complete camp on evening prior to travel day. We include the travel days on the camp forms and website so parents from out of town book travel for their children on the correct dates and understand that their children are supervised from the time they land in Unalakleet until their departure. ​On the last day at camp, campers receive their camp t-shirt, enjoy a BBQ and closing service with the community of Unalakleet at camp before heading into town. Out-of-town campers either fly out that night, or lodge at the auditorium with camp staff if they do not have written parental permission to stay with family or friends in Unalakleet. MARC Pilots have been flying for Bible Camps around the state of Alaska for over 30 years. (www.marcalaska.org)There is a camp contact for MARC in each village who will contact you the day of the flight to notify you of the time to go to the airport. Flight schedules are subject to change due to weather and routing as MARC planes transport campers to and from several villages. When a camper registers for camp, there is a place to include their travel details. Camp staff will pick students up at the airport, and bring them back for their flight home at the end of the week! Learn more about camper travel on the CAMPER TRAVEL page. I was familiar with the Covenant Bible Camp of Alaska well before sending my own kids there... even before becoming a mother; not because I had attended myself but because I had heard many camp stories told by my husband, his siblings, and friends. Bible Camp was part of everyone’s favorite summer memories! Finally, I had the opportunity to see it for myself. It was going to be my first time in Unalakleet so I was already super excited! I served as a kitchen staff volunteer my first week and a counselor my second week. I was very impressed with how well you eat at Bible Camp. Each meal is carefully planned, copious, and just plain delicious. “Home” cooked meals everyday... at camp! As a counselor, I got to experience everything the children were doing every minute of the day. From worship and chapel time to the many daily activities (art classes, hiking, outdoor team games, swimming, steam bath, canoeing,...) campers are kept busy, happy, safe, and spiritually fed!! Worship time alone at Covenant Bible Camp is a truly unique experience. You can really feel God’s presence there! Let’s not forget about cabin clean up time, during which campers are encouraged to be creative. Each cabin is inspected daily and points are awarded according to different criteria. Results are revealed during the evening worship and chapel time time! volunteers make this camp happen every year: counselors, speakers, office staff, cooks, pilots, to name a few. Send your child(ren) and they’ll want to come back every year! ​Volunteer at Covenant Bible Camp and you’ll find out, as I did, that there is a little piece of heaven near Unalakleet, AK called Covenant Bible Camp where even adults have a blast!